What is AWS (Amazon Web Services)? AWS is a Cloud Infrastructure-as-a-Service (Cloud IaaS) platform offering compute power, data storage, and a wide array of other IT solutions and utilities for modern organizations.AWS was launched in 2006, and has since become one of the most popular cloud platforms currently available.Amazon Web Services is a platform with over 1 billion customers like Azure, Google Cloud Platform.In order to understand the necessity of using Amazon web services in our lives, we can list the facilities provided by cloud services in the software development process.AWS offers numerous advantages for organizations like reduced management overhead, simplified implementation, and significantly reduced costs versus comparable legacy solutions. In fact, AWS has been such a game changer that many organizations are eliminating on-prem data centers altogether in favor of hosted implementations from AWS. In today’s world, software consistently, securely, flexible and fault-free service is as valuable as the software itself.For this reason, companies or institutions should not only develop their own products but also keep their presence alive.Cloud operating systems have become necessary so that people can better focus on their problems and serve their products with less cost.Along with the evolving software world, cloud operating systems are not only responsible for a lot of leased machines.Providing the ability to follow modern technology with security, authorization, testing, database diversity and extra features are the main features of cloud operating systems.To summarize, it provides server services (EC2), database services (DynamoDb, RDS), content distribution (CloudFront) and many more services to facilitate the development of software developers’ applications by modifying and improving the content of cloud computing services.Using these services, you can develop reliable, scalable and flexible applications. 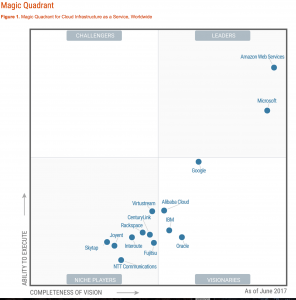 According to research results from Gartner Inc., which conducts market research in technological fields in June 2017 , AWS ranks first among companies providing infrastructure services (IaaS).On the basis of this leadership, the variety and quality of the services provided by AWS are available.Using AWS Services, you save yourself a lot of load. You can focus on developing your application without worrying about factors such as servers security, internet access, electricity, etc. With AWS, you can quickly get your applications up and running and you can reduce your expenses by paying as you go. Region:It is the name given to server fields that are completely independent and isolated from each other. Availability Zone:It is the name given to small server sites located close together in a region. There can be more than one availability zone within a region and each is named with a zone letter.For example, in the Oregon region there are three availability-zones (us-west-2a, us-west-2b and us-west-2c). 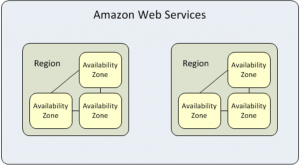 Understanding the difference between the above visual, region and availability zone will help.AWS operates in 16 different regions in 44 zones worldwide. These numbers are increasing rapidly. The plans made in 14 new zones and 5 new regions are shared on their own sites. EC2:In documents related to Aws, the servers are named “instance”. We can maintain the same harmony as it is compatible with foreign documents and it is ear-folded. AWS has a large variety of flexible instances that can serve different purposes and know different operating systems. This makes AWS very compatible with modern micro-service architects. IAM:We can say the two most important criteria for our security and authorization services. Many companies apply different levels of certification in order to prove the safety of their systems. In this regard, AWS offers easy solutions for authorization and security issues. S3:The S3 service called “Simple Storage Service” offers unlimited data storage and requires a very small fee for this service. Using S3 to back up or store many of your secure data is a great convenience. LoadBalancers:As mentioned above, building a flexible infrastructure is an inevitable requirement for software architecture. The AWS Loadbalancer service allows your instances to run at equal intensity and offers a solution that comforts the user in many aspects with its extra features. CloudWatch:Its a monitoring service for AWS cloud resources and the applications you run on AWS. You can use Amazon CloudWatch to collect and track metrics, collect and monitor log files, set alarms, and automatically react to changes in your AWS resources. Databases:The databases provide diversity according to the usage purposes and offer many plus and minus according to usage areas. AWS offers many varieties to its users. Virtual Private Cloud:Amazon Virtual Private Cloud (Amazon VPC) lets you provision a logically isolated section of the AWS Cloud where you can launch AWS resources in a virtual network that you define. You have complete control over your virtual networking environment, including selection of your own IP address range, creation of subnets, and configuration of route tables and network gateways. You can use both IPv4 and IPv6 in your VPC for secure and easy access to resources and applications. Route53:Amazon Route 53 is a scalable domain name system (DNS) service intended to give business and developers a reliable way to direct end users to applications. This is accomplished by translating domain names (www.websitename.com) into the numeric IP addresses (123.12.3), which is how computers connect to each other. API Gateway:Amazon API Gateway is an Amazon Web Services (AWS) service offering that allows a developer to connect non-AWS applications to AWS back-end resources, such as servers or code. Amazon API Gateway allows an AWS customer to increase the overall utility of Amazon’s other cloud services. Lambda:AWS Lambda is a compute service that lets you run code without provisioning or managing servers.